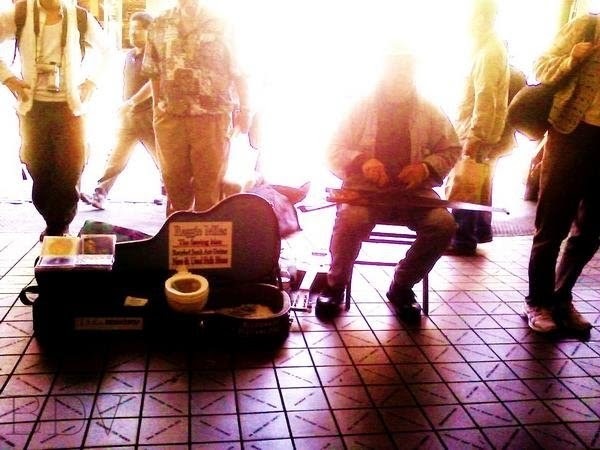 There was a man who played his music in the downtown market long ago. If he was strategic enough, he'd get a populated area on a weekend day where he could make $30 an hour doing what he loved - making music and sharing his passion with others. He is one amongst hundreds of other street performers who make our city all the more cultured and lovely. If you walk around downtown, there are numbers of streets and corners where you can find musicians, painted statue people, and talented dancers, to name only a few talents. Their goal? To share their passion - to tell a story through their art. The man above sang folk songs along with with his playing and sang of hard times in life and just trying to make it through. Fairly relative to a lot of people. Moving, even. Do you have street performers in your city? Who are your favorites and what are their stories?